The majority of offline SMEs (68 percent) believe there is simply ‘no need’ to have a website. When probed further, respondents said that this is because most of their business is word-of-mouth (78 percent); others said that they already have lots of business (23 percent) or are happy with the scale of their business (17 percent). Reassuringly, only 17 percent said they see no value in having a website. Aside from the SMEs who believe there is ‘no need’ to be online, others struggle to get online. A third say a lack of time is keeping them offline, while 29 percent say a lack of expertise and 26 percent, cost.Interestingly, more say concern over cyber security (17 percent) is a barrier to going online than a lack of reliable internet connection (13 percent). In the last wave of research, a poor internet connection was responsible for keeping 17 percent of businesses offline. Encouragingly, 20 percent of SMEs say they are currently in the process of building a website, up sharply from the 8 percent recorded in the last wave of research. The number saying they have no plans to build one in the near future has dropped from 66 percent to 57 percent. No SME can exist without customers. When building the dot ie Digital Health Index we wanted to show a complete picture of the online behaviours and activities of both Irish businesses and consumers. 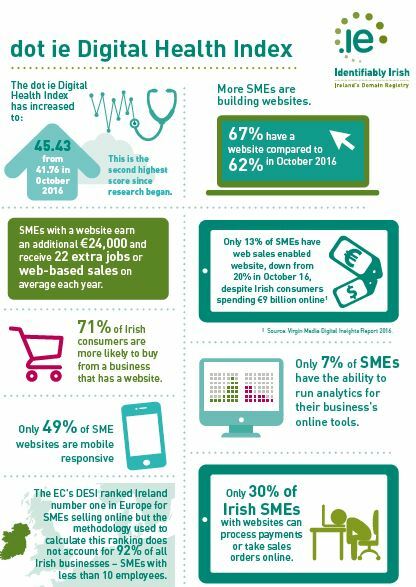 In addition to surveying 500 SMEs, we also surveyed 1,000 Irish consumers to assess what they do online and what they look for from an SME’s online presence. Our research shows that 83 percent of consumers think SMEs should have at least a basic website that lists contact details, while 68 percent believe a business is ‘outdated’ if it doesn’t have an online presence. 71 percent are more likely to buy from a business that has a website. Among the SMEs that are online, few can engage in e-commerce (selling online): 30 percent can take sales orders or process payments, while just 29 percent can accept bookings or reservations online. Only 37 percent of SMEs promote their businesses online, spending an average of €161 per year on search engine and social media marketing. While these numbers are disappointing, there is reason to be optimistic. The latest edition of the IEDR dot ie Digital Health Index shows an overall improvement in Ireland’s digital health, with the Index score rising to 45.4, the second-highest since research began in 2014. The Index assesses the number and quality of digital assets owned by 500 Irish SMEs, like websites, social media pages and e-commerce tools. The increase in the Index score has been driven primarily by an improvement in SMEs’ perception of the quality and performance of their own digital assets; and by an increase in the number of SMEs with websites (67 percent compared to 62 percent in October 2016, the last wave of research). Commenting on the findings of the latest dot ie Digital Health Index, David Curtin, our Chief Executive, said: “While it is very encouraging to see more SMEs with websites and improved confidence in their digital assets, most are failing to take advantage of the full benefits of an online presence and e-commerce. “Less than a third of businesses with websites can take sales orders or process payments via their website, yet Irish consumers are buying online in huge numbers. Our e-commerce market is set to grow to €14 billion by 2021, but most of that spend is predicted to go abroad. We live in an age of convenience. With so many international retailers online and offering complete shopping experiences already, offline SMEs in this country face an uphill battle winning back the loyalty of Irish consumers. This is a huge and ongoing loss, considering Irish consumers’ willingness to buy Irish. “The dot ie Digital Health Index’s findings also dispute the European Commission’s recent DESI (Digital Economy and Society Index) report that ranked Ireland’s SMEs number one in Europe for selling online and selling online cross-border. However, the DESI report excludes micro-enterprises with fewer than ten employees. Micro-enterprises make up 92 percent of all businesses in Ireland, so this omission has the potential to be highly misleading. “There is an ongoing misconception among many offline SMEs that building a website and maintaining an online presence is difficult and time-consuming. The opposite is true: there are many inexpensive, easy-to-use tools that allow business owners to design and create a website suited precisely to their needs. Irish consumer expectations have shifted in this direction; they are digitally savvy and expect all businesses, regardless of their size, to have a basic website. “With these findings in mind, it is clear that ongoing collaboration between businesses, Ireland’s technology and internet sector, and the Government is essential. In this edition of the dot ie Digital Health Index, we argue for the creation of a ‘buddy system’ that links larger businesses and Local Enterprise Offices with older and less tech-savvy SME owners. Through this shoulder-to-shoulder mentorship, SMEs would acquire industry-specific knowledge on the basics of a website and the benefits of an online presence. Click here to read the full dot ie Digital Health Index.